It is a fact of life that those who call a place home need a place to get food. For regular people, that is your local supermarket. These places promise a calm and relaxed environment for you and your family to shop without the need to worry about any sort of hazardous circumstance. It is important to note though, that thousands are injured in supermarket accidents every year. It’s certainly not easy with so much foot traffic from shoppers, but that’s why they have a team of employees to help. Unfortunately, not everyone is a model employee, and the negligence of one person could lead to a serious accident for you or your loved one. That’s where the Wolfson Law Firm personal injury lawyers and West Palm Beach supermarket accident attorneys come in. Giving us a call at (855) 982-2067 for a free consultation regarding your supermarket accident is one of the most important steps you can take in getting the compensation you deserve. We’re ready to meet with you and explain just what can happen if you suffer a slip and fall, a trip and fall, or any other accidents at a West Palm Beach supermarket regarding premises liability claims. We can inform you what should be done after an accident, and you don’t have to worry about paying a dime unless we recover for you. All of these supermarkets offer great service, but when it comes to incident and accidents, they can’t be vigilant 100% of the time. Negligent employees too may serve to make the area unsafe, and that promise given to you as a consumer to have a safe shopping environment may be broken. Supermarket insurance companies work carefully to avoid any sort of blame that may come from accidents, they usually do this by keeping record regarding cleaning, inspections, and other sorts of examinations to determine who’s really at fault when an accident ends up happening. This examination happens inside the supermarket, as well as outside, with parking lots being looked over via inspection and regular security camera monitoring. They can use this video surveillance as evidence against a victim who’s looking to get compensation. We at the Wolfson Law Firm always try and have the court compel the video surveillance for our own review. It is critically important that we be contacted right away after an accident, so we have as much time as necessary to review the evidence and build your case for you. It is vitally important to place the supermarket on notice and to also ask that they preserve any evidence including any surveillance films. Wolfson Law Firm’s supermarket and personal injury attorneys are ready to help you. 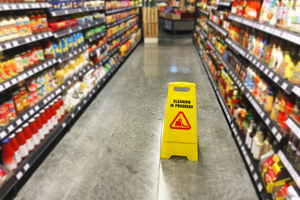 Whether you’ve found yourself in a slip and fall, trip and fall, or any other number of accidents that can occur within a supermarket, your next best step is to call us. Our managing attorney Jonah Wolfson is a personal injury and wrongful death attorney who not only is bilingual, but has a wonderful legal team waiting to hear from you. He’ll personally answer any questions you may have regarding supermarket injuries. He’s helped those working in Aventura, Dadeland, Dolphin, and Merrick Park Mall, and he’s more than willing to help you. Call now for a toll free-consultation so that you can get your life back on course, call (855) 982-2067.